I made one similar to this several years back. 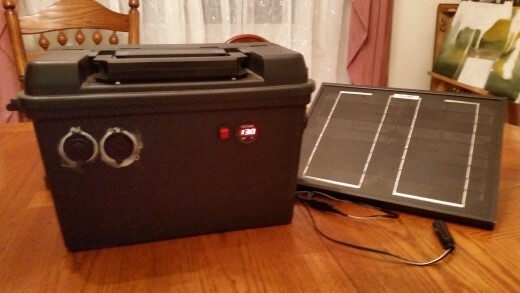 Mine uses a rollable 21 watt solar panel to charge the system which I housed in a 20mm ammo can. I added cardboard lining to the metal can for EMP shielding of the components. I also store my radios, spare smart phone, usb chargers, an intelli core battery charger, and an assortment of rechargable batteries. Lastly, I included a miniature tool kit ( cutters, needle nose, electrical tape, multidriver, and clip leads) and small multimeter. I see this as being a very useful tool and would love to know exactly how long it could keep a high-end laptop such as an 18″ Alienware laptop with the 350 watt power supply going before the battery would be incapable of keeping it going. I also use a bi-pap device to keep me breathing at night. I think it uses about 100 watts of power but I’m not sure. Would such a generator as you have built keep a bi-pap running all night or even two nights without recharging? I’ve looked at the math for all this and there is something I don’t understand about working out the equations because I just can’t figure it out. Math was never a strong point of mind anyway so its probably something simple I am overlooking. Good doc though on how to create one. And how easy is this plan to scale upward to something that actually could power like a single room in a house with like a small heater or air conditioner? Thank you for the great article! Looking forward to building my own, for I live in the perfect climate! 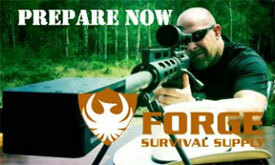 Subscribing to Tactical Intelligence has been one of the best investments I ever made! Thank you again, Erich! 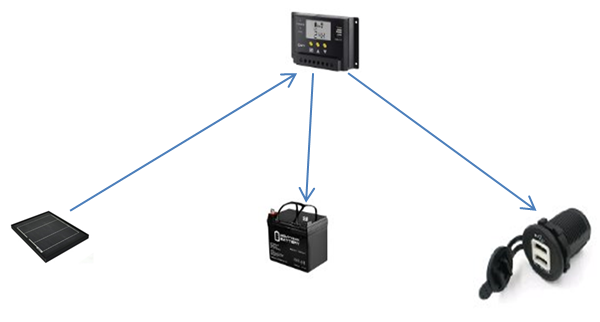 Total amp hour rating of the battery is number of amps at the rated voltage the system can deliver in an hour before being drained The battery can only charge at a rate that is limited by the charge controllers maximum watt rating times it’s voltage rating ( eg. 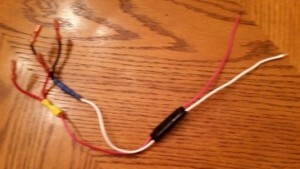 20 amps x 12 volts = 240 watts max solar panel input power). 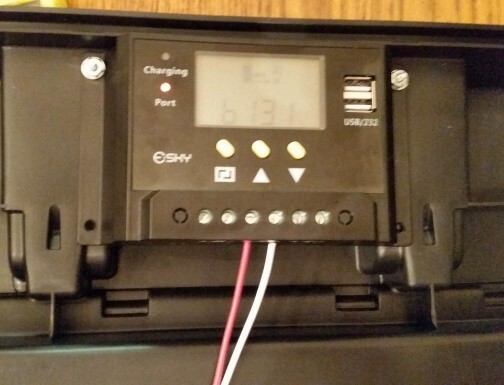 If you have a 21 (15v at 1.5 Amps) watt panel like mine you can fully charge a 35 amp hour battery in 26 (35 ÷ 1.5) hours of full sun on the panel. 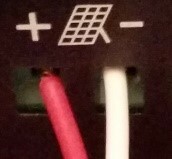 A 240 watt (30v at 8 amps ) panel would charge the same battery in 4.4 hours (35 / 8 ) of full sun. Watts consumed times hours used equals watt hours consumed by the device in a given time frame. Watt hours / volts equals amp hours required at a given voltage. Your 100 watt cpap (eg. 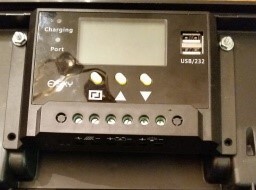 12V at 8.3A) unit would only run for 4 hours off the fully charged 35 amp hour battery (35 / 8.3 ) cited in the parts list. When calculating run times from watts, be sure the system voltages are considered. 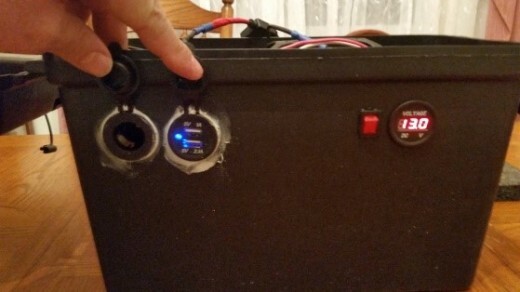 24V at 5 amps consumes 120 watts. 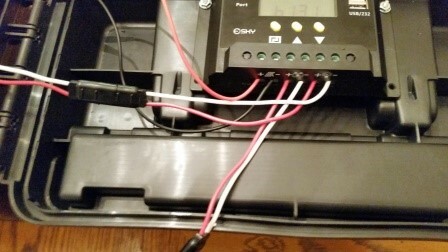 12V at 5 amps consumes 60 watts. A 24 volt battery at 35 amp hour rating has more deliverable watts than a 12 volt 35 amp hour battery if both are fully charged. I have 26 Solar Panels on my Roof and they are connected to the Grid, so that I get Credit on my Power Bill. So when the grid goes down they do too. Then my Natural Gas Generator comes on in 14 seconds, that is connected to the Natural Gas Pipeline. How can I use what I have to charge up these batteries? 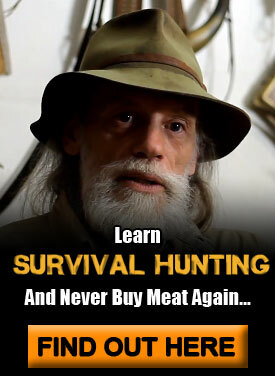 No it will not. 35 Amp Hours is not a lot of energy. 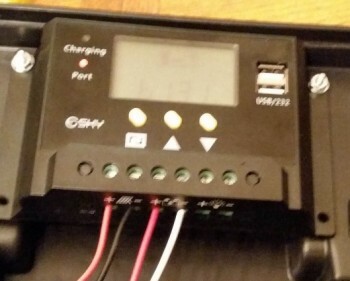 Assuming your bi-pap draws the 100 watts continuously, at most the battery shown here will run it for 4 hours. It would run your laptop for about an hour. This system is small to be portable and will recharge cell phone and other small electronic devices. Anything with a motor or that does physical labor will not run long on this system. 400 AH / 8.33 = 48 Hours. The GC2 battery is a 6 volt battery so as you correctly stated two batteries must be wired in series to get the required 12 volts. The available amp hours of the two batteries in series is still the same as one battery. Amp hours are not added in series (red to positive; red to black; and black to negative), amp hours are added only when wired in parallel ( red to red; black to black). Watts sum in either parallel or series. These rules apply to solar panels and batteries alike. These rules are fundamental to all circuits. Thank you for this excellent project. Going to build one for myself. What is the make or where can we get a battery readout like yours? It looks really nice. I designed and built my off-grid system, then lived it for two years. It worked well and I’ve since started upgrading. I see a few issues with this design. 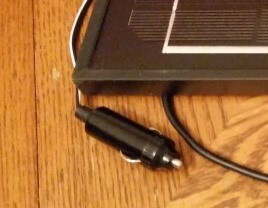 First and most important, the 10 watt solar panel is far too small to be of practical use. In winter, if it is directed at the sun, a user would get between 30-40 watts of charging per day. 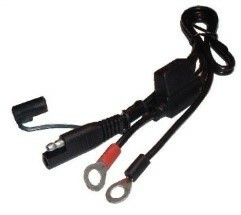 Subtract from that, the losses from charging a cold battery and from extracting the power afterwards. It’s simply too small. In summer, the charge would range from 50-80 watts per day, again in full sun with the panel appropriately directed. Subtract battery losses of about 30% and you’ll see the panel is still too small. I would suggest a polymer panel which rolls up as an alternate source of charging. There are panels in the 60-80 watt range that are very small when rolled up. Another option would be to use folding panels. The remainder of the design appears very solid. Kudos for a great article, and a good DIY project. I built a kit like this but with 2 batteries and a 35W solar panel and charge controller, all from Harbor Freight last year. 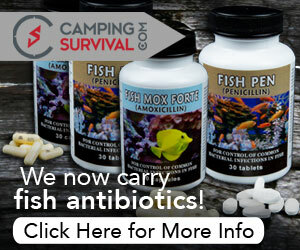 I used it for camping and it worked great. I needed it to power my CPAP machine, like your Bi-PAP. It lasts all night for me on just one battery. During the day, I recharge the battery and at night use the second battery. I just rotate the batteries each night.